When a polar bear arrives unexpectedly in the woods, the animals fear and avoid him, suspecting him to be dangerous - and his habit of collecting leaves only adds to their distrust. Then one day, they watch as he attempts to fly over the water with wings made of colorful leaves...just trying to go home. Maybe he needs some help? Sandra Dieckmann is an artist, illustrator and potter from the UK. She is best known for her colorful, patterned and intricate drawings of nature and wildlife. In 2011 Sandra was chosen by Oscar-winning animator & illustrator Shaun Tan as the Emerging Talent in Illustration for her image 'Fox Tree'. A timely story, one that yields multiple interpretations and meanings, from the "othering" of unfamiliar populations and those seeking refuge from a changing world to the impacts of climate change. Dieckmann beautifully weaves together some of today’s most difficult themes into a deceptively simple tale. 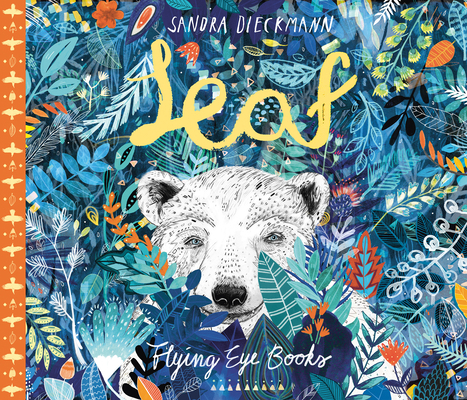 A beautiful debut from Flying Eye [...] the intricate images, filled with polychromatic leaf-patterns and dynamic stillness, are too good to miss.